This card is much better looking in person. It's creator is trying to improve on her camera and lighting skills, I promise. It's 12:25 a.m. 6-23-09, I was planning on getting this card posted before midnight, but as you can see, didn't make it. So, 2 challenges to start a fresh new day! How about that purple, gals? Supplies: Card Blank 6" X 6" square from 12" X 12" card stock, all papers from my scrap box, Ink: Ranger Archival Ink-Jet Black, gel pens, Sakura Gelly Roll-Clear Star, Stamps: Stampendous-SSC039 Window Box Set, CTMH-D1272 Slumber Party, Cuttlebug-Flower dies, ribbon-Hobby Lobby, flower brads, Hero Arts-adhesive crystals, Stampin Up-Ticket Punch, EK Success-small flower punch. 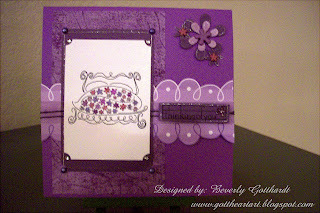 Beverly, love the shades of purple that you combined! Can I crawl into that bed and have a long nap? LOL Looks so comfy and cozy! Welcome to Pile It On! Are you a night owl like me? I always end up w/ not very well lighted cards due to finishing my cards around midnight! I have learned my lesson and now wait for the next day to snap the picture! I love your colors! is that SU stamp? Thanks for Playin' w/ us! Beautiful job!! I love that stamp! I think I might have it too!